​at the Home and Garden Show's tulip area Thursday. Alexander has painted seven of the Canadian Tulip Festival's large tulips since 2002. The festival runs this year May 11-21. 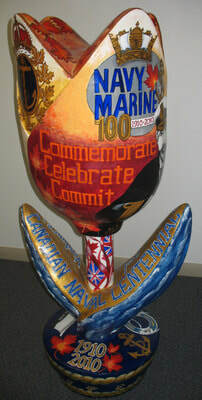 400 of the 5 foot tall fibreglass paintable tulip forms created as a blank canvas for Ottawa area artists. ​for the Canadian Tulip Festival. #8 - 2018 - The Royal Wedding Tulip - "Once Upon An Enchanted Dream". This is #2 of the Royal Wedding Tulips. #1 of this duo was my 2011 "Once Upon A Time" painted for The Duke and Duchess of Cambridge. Why? I was married 1 month after Diana, I have 2 sons as does Diana, my eldest son married his princess 1 month after William and my youngest son is marrying his princess very soon this summer. As the Mother of the Groom(s) I am here to celebrate in the joy of my son's weddings. I am doing this for Diana, the Princess of the People. ​#1 - 2002 - Ron Kolbus Memorial Tulip – The purchase of Ron’s Tulip was organized by community leader Wendo Blondeau who formed a group called the “Friend’s of Ron”, together they bought this tulip in honour of former city councillor and friend Ron Kolbus who had passed away. This tulip depicts the Britannia Beach area at the turn of the century and the current view of Andrew Haydon Park. This 5ft tulip called “Ron’s Tulip” was a gift from the “Friend’s of Ron” and is on permanent display in the Ron Kolbus Centre, Lakeside Gardens located at Britannia Beach in the building that was renamed in his honour. ​​#2 - 2003 – Painted as a tribute and in memory of Diane Stuemer, much loved Ottawa Citizen writer and author of “The Voyage of Northern magic”. My inspiration came from Diane’s “going after her dream” determination of a world wide sailing adventure spanning 4 years with her young family. #3 - 2005 - ​Colors of Spring Tulip – Vibrant tulips (flowers with attitude) pop off a black background with my signature swirl design. Inspirational script of “Follow Your Dream - Passion - Faith - Believe” is my message for viewers. This tulip was featured on Regional Contact CTV hosted by Kathie Donovan. Colors of Spring was one of 3 tulips stolen from Ottawa City Hall from a display of 150 tulips. The theft of this tulip received major media coverage across Canada. Although seriously vandalized, it was recovered quickly due to the vast amount of on-line, television, radio and newspaper attention. Good samaritan, Eric Martin repaired the damage and along with a new coat of paint it received royal treatment and a place of honor upon it’s return. #4 - 2009 - President Barack Obama – “Yes We Can” Tulip - I was honored to be asked by Wendo Blondeau, Canadian Tulip Festival Sponsorship and Special Events Co-ordinator and Julian Armour the Festival Director to create a Presidential tulip in honour of President Barack Obama’s first state visit to Canada. "Yes we Can" received international news coverage! 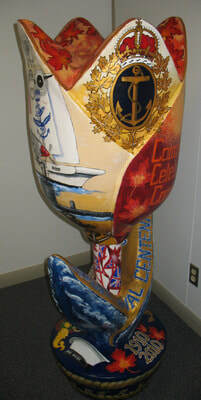 This tulip focuses on the inspirational and spiritual messages from the Inaugural Speech. “God Given Promise – All are equal, all are free, all deserve a chance to pursue their full measure of happiness.” “The world has changed and we must change with it” and “Hope, Freedom, Unity, Liberty, Peace”. On the base is a quote from Abraham Lincoln, “That this Nation under God, shall have a new birth of freedom”. 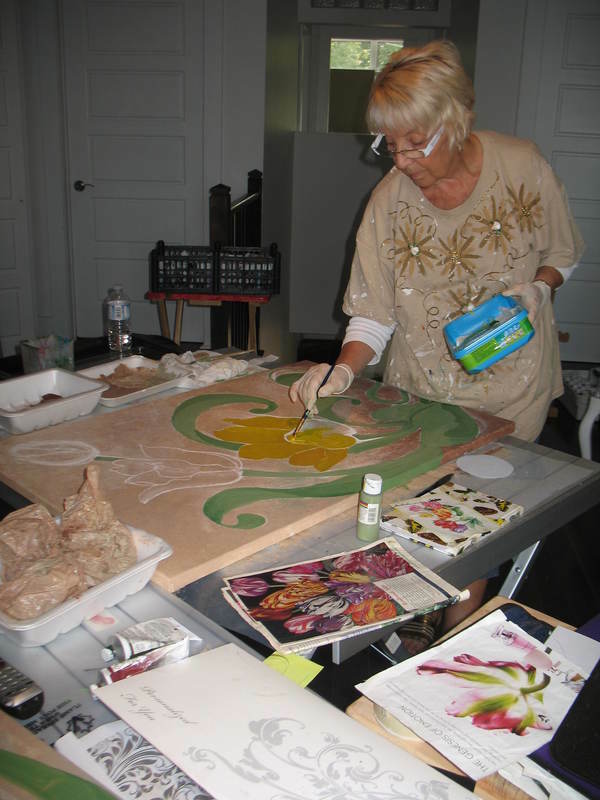 The “Yes We Can” tulip experience was one concentrated week of painting versus the the 4-6 weeks spent creating each of the other tulips. The “Yes We Can” tulip was a gift from the Canadian Tulip Festival to the American people. I presented this tulip to US Ambassador David Jacobsen in a special ceremony. He invited me to the Embassy to give a talk about the tulip once it was delivered to the Embassy. I created three copies of a leather bound book about this tulip with extensive photos and explaining all aspects of the design. The Ambassador received one book along with a painting of red tulips and the quote “The world has changed and we must change with it”. He was happy to send a copy to President Obama and to Oprah! 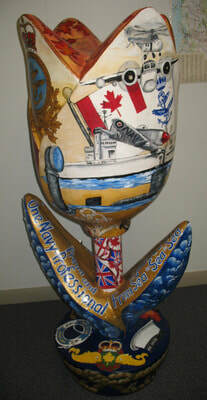 #5 - 2010 - The Canadian Navy's 100th Anniversary Tulip. Presented to the Vice Admiral at a special ceremony. This tulip received across Canada media attention! #6 - 2011 - Once Upon a Time - The Royal Wedding***The spectacular photos in this album are the work of fine art photographer,Glen Howard. www.ghphotography.ca ***I was always fascinated by the beauty & grace of Princess Diana, I was married one month after her wedding, & I am also the proud mother of two son's of my own, Matthew & Taylor. My eldest son, Matthew, married his very own princess, Ashley, one month after the Royal Wedding. As the mother of a groom, I was inspired to portray a mother's special love for her little prince on the most important day of his life. This tulip illustrates the two very special women in Prince William's heart. A grown Prince with this beautiful Princess Kathryn, & the special love and connection between a little Prince and his mother, Princess Diana.I created a "Once Upon a Time" photobook incorporating Glen Howards amazing photos as well as my own and those of my photographer son Matt. My intention was that this book would be delivered to the hands of the Royal Couple. I worked weeks on the script for the book as I wanted to convey to the Duke & Duchess of Cambridge my inspiration behind the design. On October 4 2012, I hand delivered this book to Joel Girouard, Director of State Ceremonial & Corporate Events for the Department of Canadian Heritage. He is the mastermind behind the planning of the Royal Tours to Canada, Joel travels with the Royals when they tour! My book was delivered directly to the Duke & Duchess! This tulip received world wide news coverage! #7 - 2012 - Freedom, The New Beginning.